The man who served as Grenada’s second Governor General after the island gained its independence from Great Britain, died on Monday. The 78 year old who has being ailing for sometime died at this home in St Pauls. 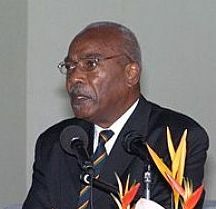 Sir Paul Scoon, GCMG, GCVO, OBE was Grenada’s Head of State for 14 years, from 1978 to 1992. Scoon was born on 4 July 1935 in Gouyave, and had his primary education at St. John’s Anglican School and then the Grenada Boys Secondary School. He then received an external degree from the University of London before going on to study at the University of Leeds, England and gaining an M.Ed. at the University of Toronto, Canada. He returned to Grenada to teach at the GBSS but he moved from teacher to Chief Education Officer and finally becoming Secretary to the Cabinet. He was awarded the OBE in 1970 and in 1973 he returned to London to fill the post of Deputy Director of the Commonwealth Foundation. In 1978 he was appointed Governor General. By the time Sir Paul Scoon left office he would have worked alongside six heads of Government and established an interim Government in the aftermath of the collapse revolution. His memoirs are published in a book entitled Survival for Service that provides a personal account of his experiences as Governor General.